Got it cut out using an Ulfa razor knife and a razor saw, and it came out like I envisioned! I just need to clean it up a bit and make some magnetic mounts. I will also need a little grab handle to pull it up with as it sits pretty tight and flush. I found this little razor saw, that TexMechsRobot recommended some time ago and it works great. 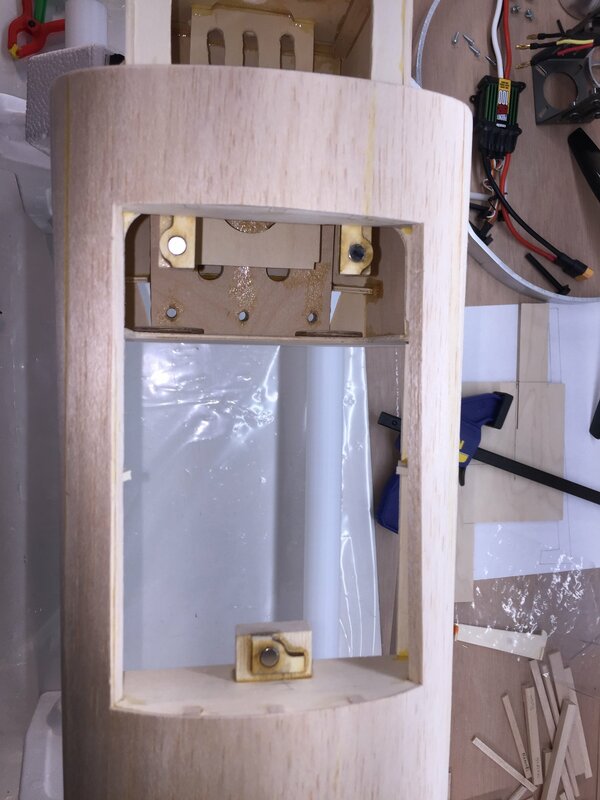 A battery hatch is born! The hatch looks great! Nicely done! Do you remember where you got that little triangular razor saw knife blade from? I haven't seen one that shape, and it looks more controllable than the "bottle nose dolphin" style ones from xacto that love to bend sideways. Yeah, I need to get me one of those. That hatch looks super clean. Well done! Just click link above, Amazon. That hatch is super SUPER clean! You're making quick work of this one! I’m getting a little burned out though, that hatch took a lot out of me to figure out. Hopefully I chronicled it thouroghly in case I need to do it again in the future. 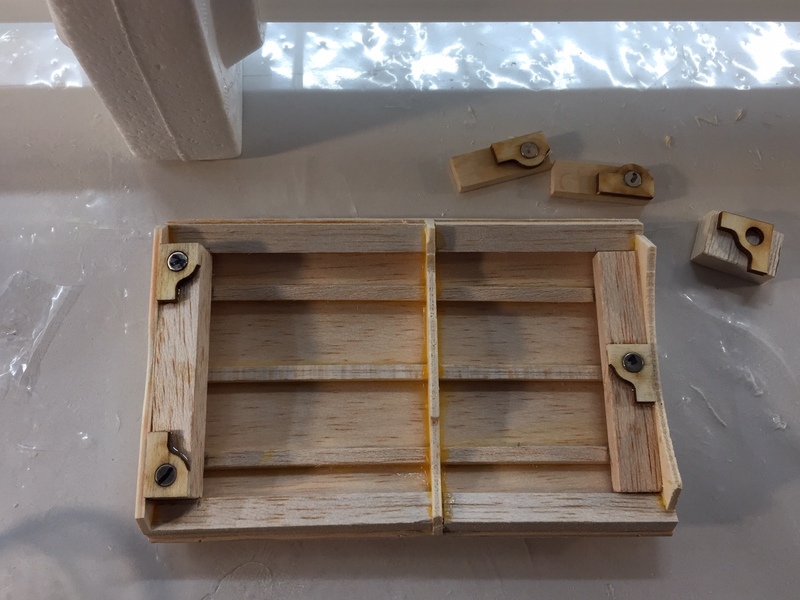 It’s hard to find detailed steps on how to do hatches like this, so I always try to do complete threads in hope to help others. Keep at it. You are doing awesome so far. This is going to be one pretty plane when she's all done. And I know I've learned a lot from all these builds, so thank you! I can totally relate to the burned-out feeling. My best suggestion is to strategically move onto something that you DO NOT have to think about too much. Even if its just ironing on covering to control surfaces. You make a little progress... you see a bit of change... the need to build comes back you you become re-motivated. 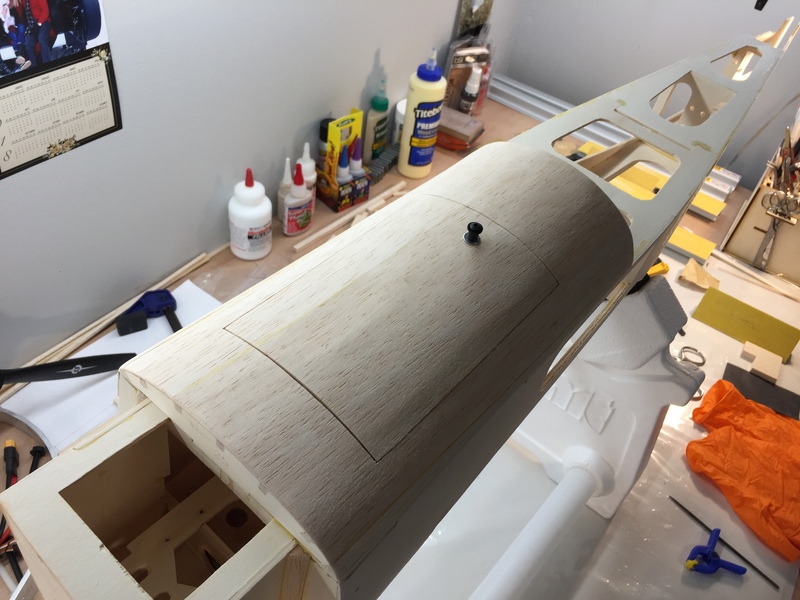 It's kind of where I am right now on the P-47 build. I broke my ankle so I've been limited to what I can do in the shop hopping around like a bunny. I can do some small fitting things while I heal up and not lose too much momentum on the project. Best of luck but you really are doing some clean work... Something to be commended for certain. I love those razor saws. I use them for scribing panel lines on my plastic models. They are so thin that they don't remove too much material but the metal is strong enough to take some force. The hatch looks great. It's not unusual for one little detail to turn into a whole project. When you get cross-eyed from looking at the same part for too long it's time to put it down for a bit and switch to something else. Preferably something simpler. Maybe a completely different unrelated project. Funny how the brain keeps working on a puzzle even when it's not focused on it. 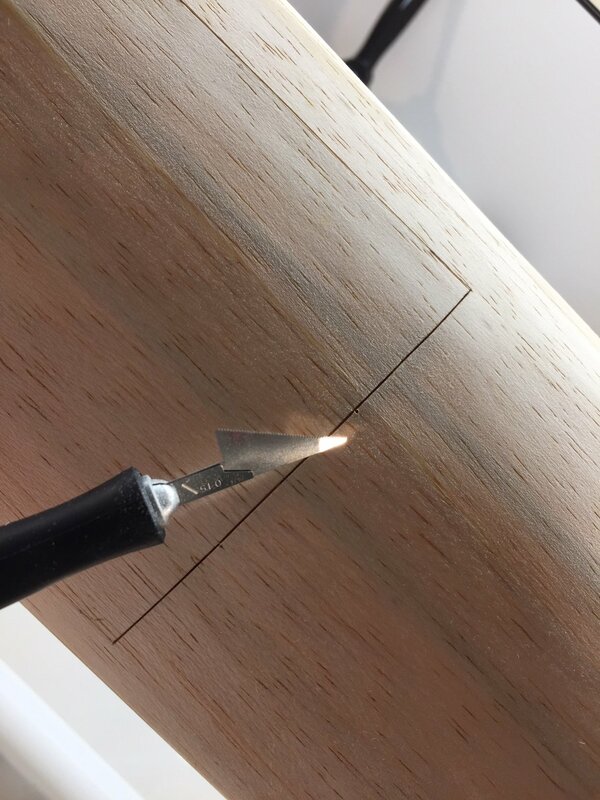 It's not unusual for one little detail to turn into a whole project. Funny how the brain keeps working on a puzzle even when it's not focused on it. This is why I love building. The joy that comes after solving a problem is incomparable to most else. I get frustrated when I run into an issue and then mull over it for far longer than needed testing multiple solutions in my head and then finally settling on what I think is the best course of action. When it works out, there's nothing more satisfying. I have a feeling that many (if not all) of you that build because you enjoy it find similar pleasure in the process. Flying is about 20% of why I'm in this hobby. The other 80% is the joy of the build. Flying is about 20% of why I'm in this hobby. The other 80% is the joy of the build. Amen! I understand completely. Sometimes the flying part is just proof of a successful build. Working on the magnet mounting now for the hatch. I may have some overkill here, but everything is lining up very nice with the parts I am using from the Retro RC hatch latch kit. 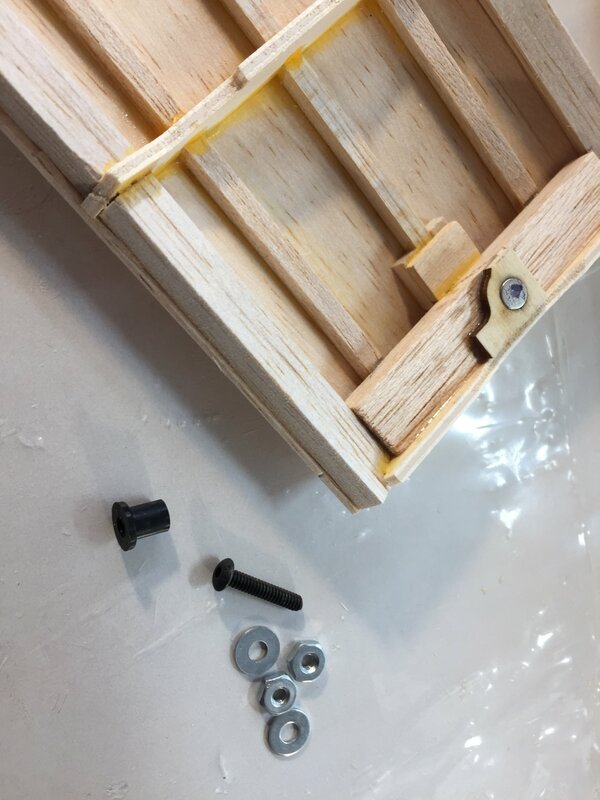 I have used this kit for 3 planes now and I like the laser cut parts for epoxying in the magnets. 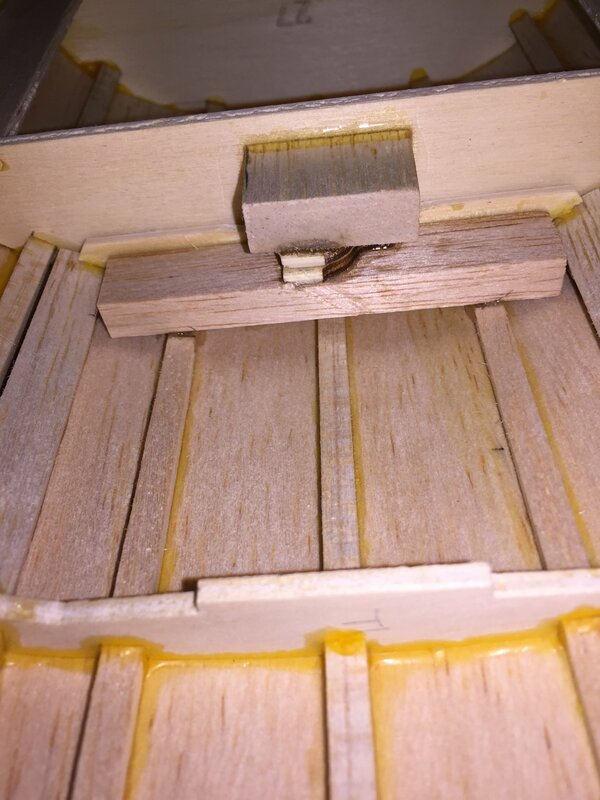 Got the rest of the magnet attachments epoxied in to the fuse using the hatch to keep things aligned, removed the clamps and it all is staying lined up nicely. It doesn't look pretty in there, but it works and everything will be out of the way when installing the battery. Looks good to me. Have you decided how you're going to lift the hatch? I would like to find a mini knob of some sort, but a small black screw will be it for now. I went to Ace hardware and found these litttle nylon black bushings that work perfect for #6 screws I had from RTL fasteners and fashioned a lifting knob for my hatch. 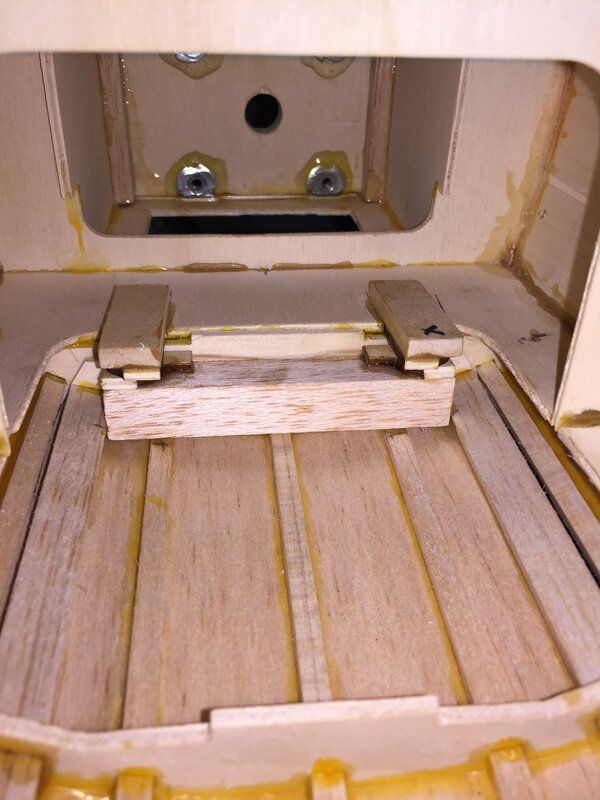 Now the battery hatch is complete and has a very positive lock and nice solid sound when putting in position, it will never come off in flight as I’m using magnet to magnet force, I can actually lift the fuse by the knob and the hatch cover doesn't detach. Well, took a break from the plane for a while to enjoy some sun and warm weather we have here. Got some flying in, motorcycle riding and bicycling in. 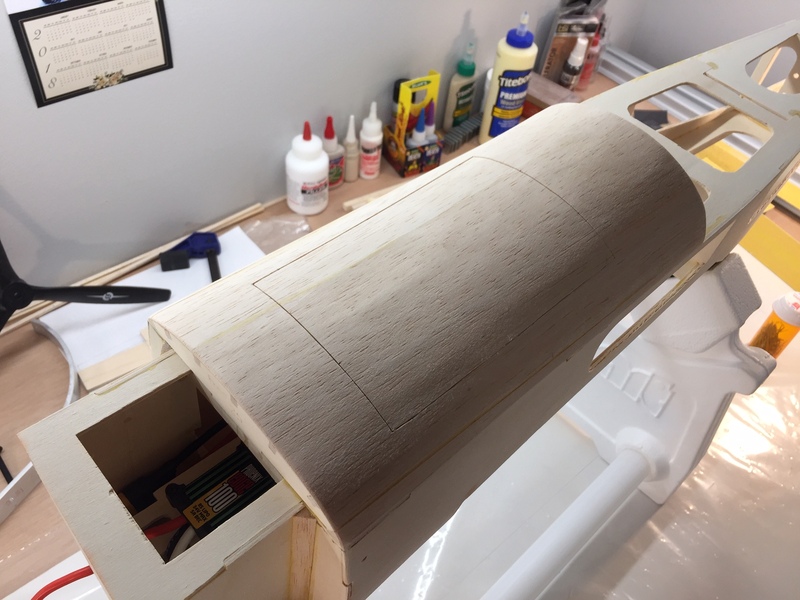 Back to the build a bit, working on gluing in some guide tubes for the elevator dual servo setup and I am going to use a pull pull system for the rudder, so no guide tubes for that. 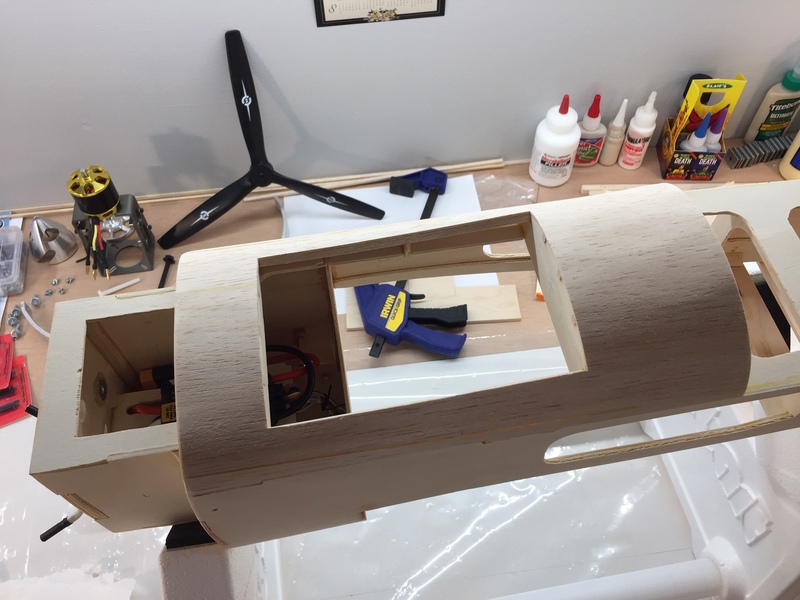 Also glued in some hardwood (basswood) pieces to reinforce the cowl bolt area as this is recommended by several other builders for this plane. 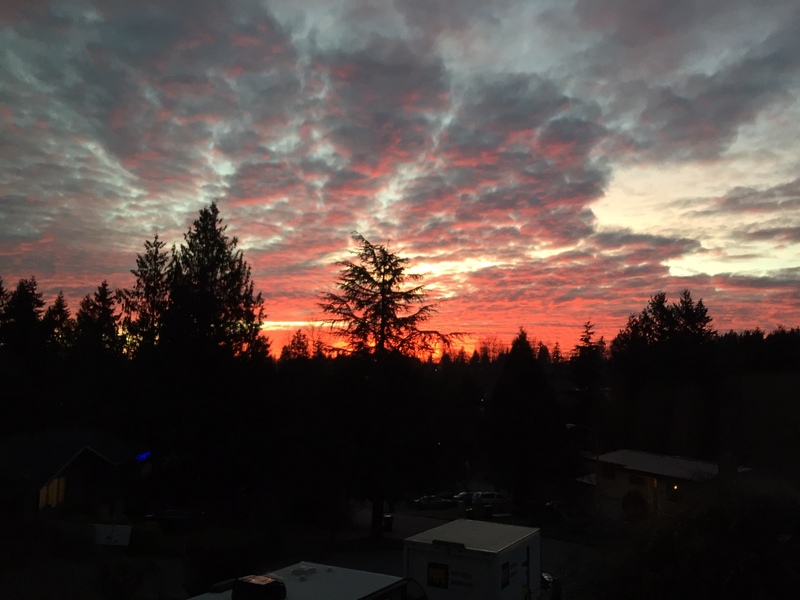 Nice weather here in Washington! Looks Good!! 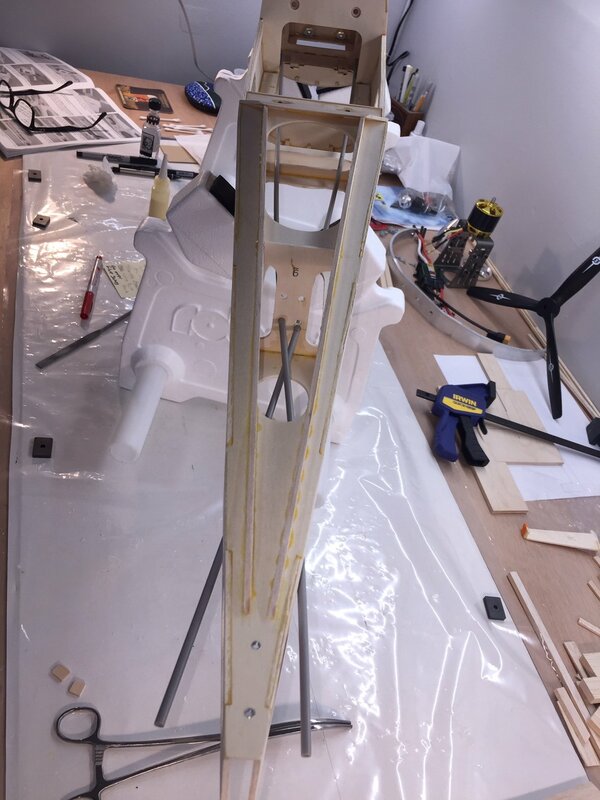 I had a similar issue with the cowling sheeting on my cub I ended up loosening the shitting and shimming the edges so they were straight instead of pulled taught between the formers. 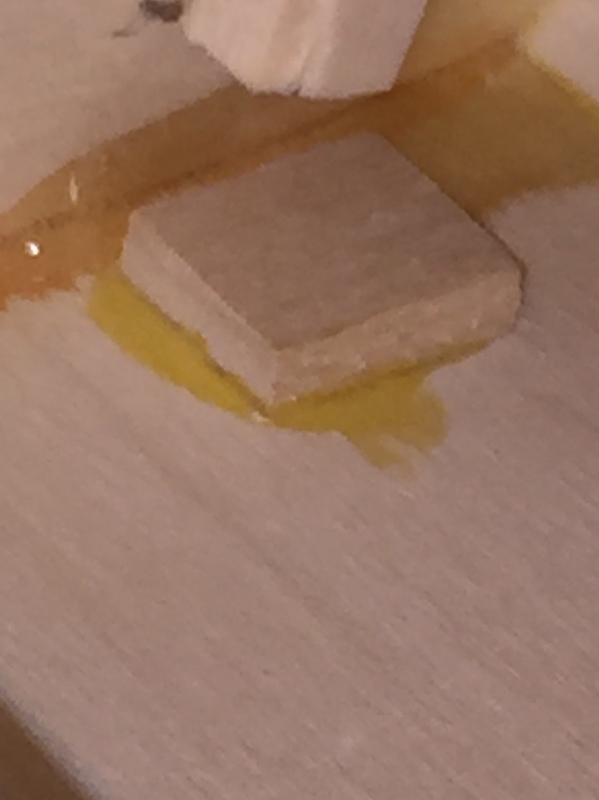 I added a stringer on the top of the formers that wasn’t called for I should have added one to each side as well. It would have made the sheeting process much much easier!